A few weeks ago, I entered the QHotels Family Ambassador Competition, and along with all of the other applicants, was shortlisted. You can see our entry here . Our entry was made before the first initial closing date, and so the girls were the first of the competition applicants to make videos, and others followed suit after seeing our videos on how the girls would revamp the Quackers Packs. It would be great to win, and get the chance to help improve the Quackers Pack, and improve a stay at a QHotel for families, and hopefully for vegetarians and those with special diets too. We would LOVE a vote to help us to win if you would be willing. 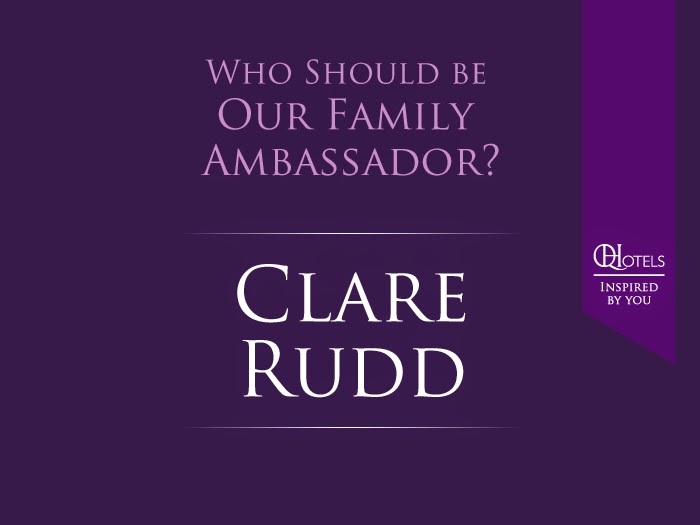 Just click on the badge below, and search Clare Rudd.